Most campaigns, at some point, require overland travel. Unless the road less-traveled by happens to have a lot of inns, this means setting up camp. 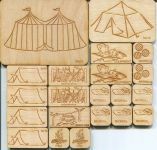 Of course, the Encampment Tile Set also makes for an excellent way to set up a scene for sneaking into a camp. Encampment Tiles are lightweight, store in very little space, durable, and quick to set up. When you're done, just scoop them into a box or bag and you're ready to go. Perfect for convention gaming!